My aching shin is breaking my sleep several times. At one point, as I know I'd hike very slow today, I don't bother with trying to fall asleep again. I get up, throw my sleeping bag into my already packed backpack leave the hut shortly past six. 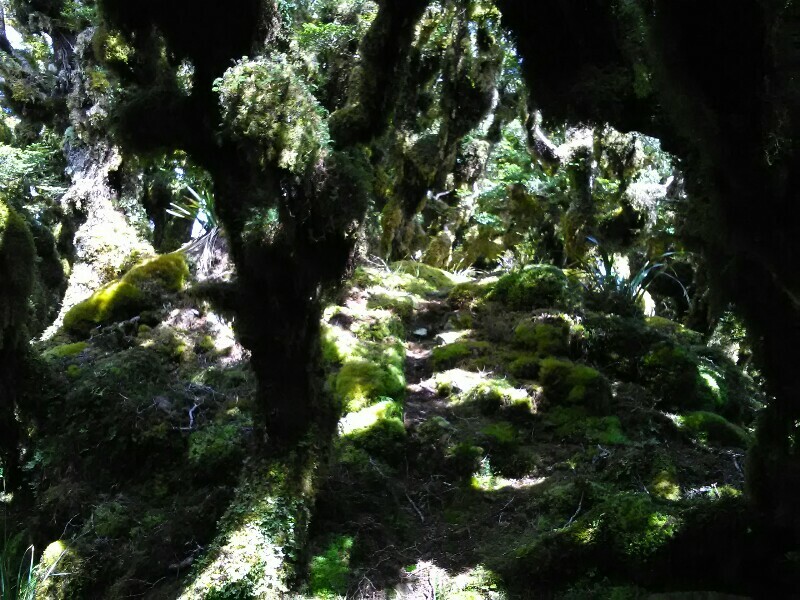 The trail climbs steeply up Pukematawai. A mix of rocks and mud all the way up to the top. Strangely, my shin copes very well with the climb so progress is very good. At the top I get treated with a beautiful 360° view of the ranges. I even catch a first glimpse of the South Island. 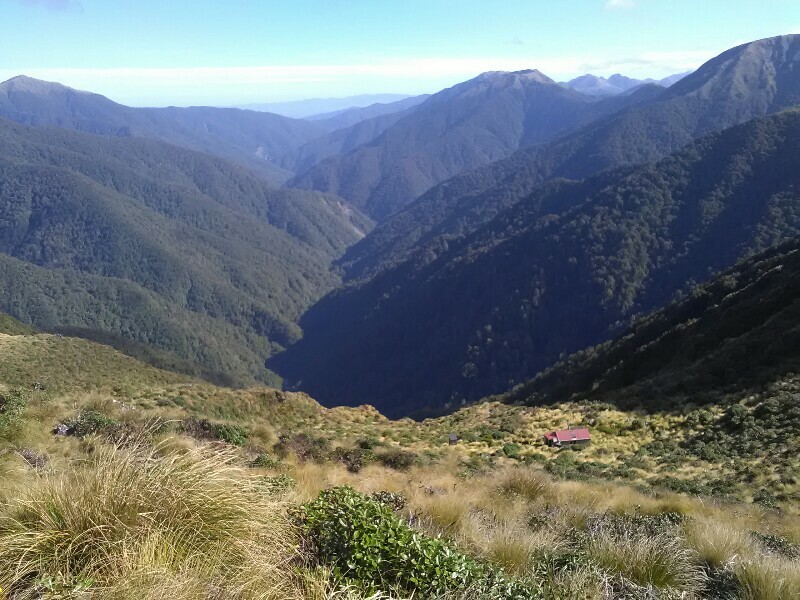 The trail then is a up and down all the way to Nichols Hut. Partly above, partly below the bush line. Some climbing parts after the Drac Hut are pretty sketchy and technically challenging. A slip would have serious consequences! My shin makes hiking slow and really painful and I start to regret that I didn't rest in Levin for a few days. But two days ago, the pain was simply not bad enough for me to justify a break and/or the urge to continue just to strong. Being now in the middle of the ranges, there's no other way than to clench my teeth and continue. And surely, while descending slowly down to Nichols Hut, I see smoke coming out of the chimney. So nice! 15 kilometers in 10 hours with a total ascent of 1250 meters and a descent of 1200 meters (which is quite a lot but I'm used to much more up and down than this...). I think I never hiked so slowly in my entire life. Still, I'm really happy I made it today. After settling in, Hannah is checking my shin. Apparently there's an inflammation in one of my muscles and the best thing I could do right now is cool it down. We use a bucket with cold water. And wow, what a relief when I put my leg in it. I enjoy it as much as can because I know it's only temporary. I thank Hannah before laying down. It has been a long, hard day. And tomorrow is going to be even more strenuous. So I want to give my leg as much rest as possible. Hi Sandro. Wow, what beautyful sights. To bad because of your legs, I hope they get better soon. Looking forward to your next post. Hi Sandro. We will hope that your leg will get better soon. 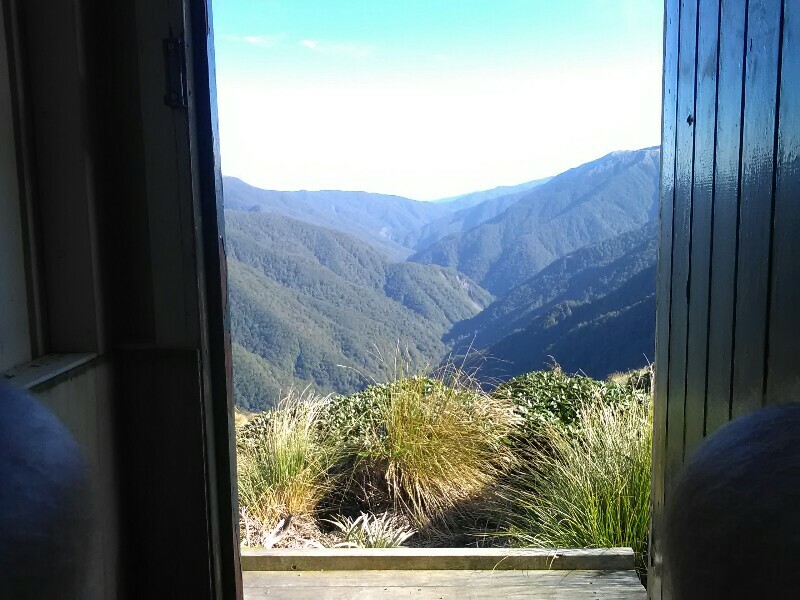 We think, when you go out of the Tararuas you have to take a rest. Your posts are so beautiful and very informative. Take care and stay safe. Hi Sandro, I am really enjoying your blog. I have followed you since day 1 and have read every day of your blog. You write really well and take good photos. Looks like you have over done it and need a good rest to get your leg right. 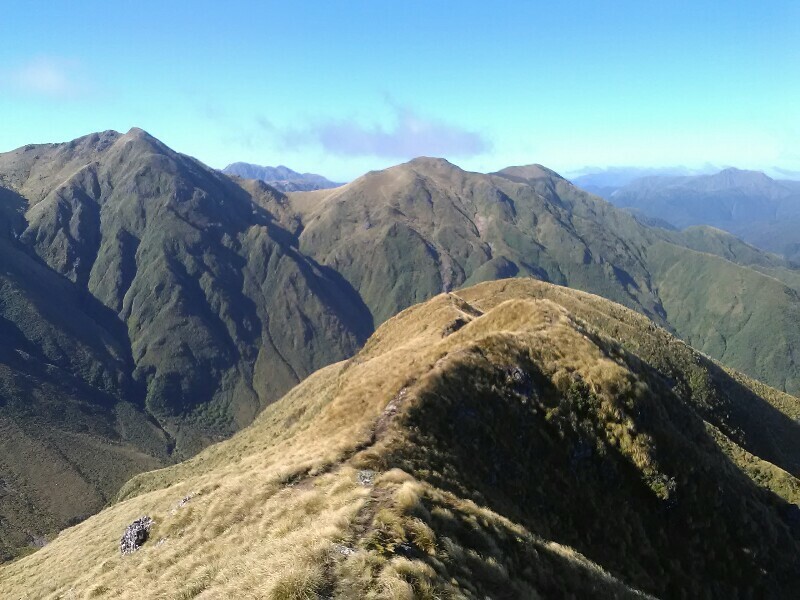 You are going to need your leg to be 100% as the South Island has some major and challenging walks.....like the Mount Richmond Range and Nelson Lakes (Waiau Pass). I have done small parts of the TA but only by chance before they became the TA (I have been on most of the upper part of the South Island). You will love the South Island, it is very different to the north. I want to congratulate you for having the foresight to do the TA and to travel from the other side of the world to do it. I would like to do the TA one day....but I cannot afford 4 months off work at present. All the best for the South Island, Grant.